Is there any benefit to diversifying? 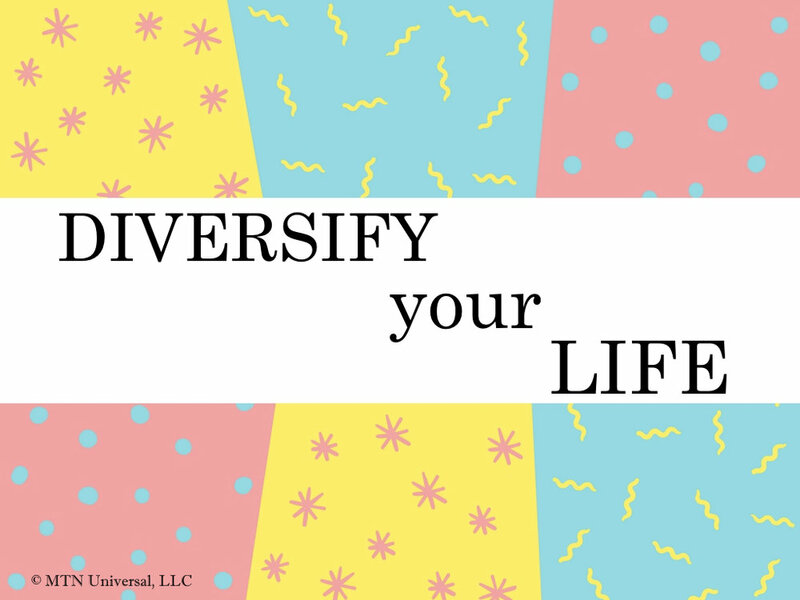 If so, are you diversifying your life? Financial advisors are good at doing this for their clients. My financial advisor is constantly encouraging my wife and I to do this with our funds. But this doesn’t just apply to financial situations. Diversifying is making different investments. Although diversification is commonly used in the financial sector, it has also been a bit of a hot topic in the workplace for the past 1-2 years. One of the reasons why it is a hot topic is because of the overwhelming research that supports how organizations benefit from diverse teams, diverse thoughts, diverse creativity, and diverse growth. Many of these same research studies also prove how diverse teams outperform their less diverse counterparts. In the future, diversity will continue to be a key piece to the personal, professional, and organizational success puzzle. So for the rest of the blog, let’s talk about a few important ways you can diversify your life to bring about the success you deserve. Would you consider yourself more of a positive or negative thinker? Are you an optimist or a pessimist? Some people make the mistake of only thinking one way, but you need to know that there are times when you have to change up your thinking. Please hear me out; you need more positive thinking than any other thought process. However, there are certain situations that require us to consider other thought processes. If you have been thinking negatively, it may be time to start thinking more positively. If you are filled with positivity and optimism, it may be time plan for more unfavorable times. Some of the best ideas have come from people thinking and planning for the worst. But it takes diversifying your thoughts. The word action is one of those words that cannot be confused with any other parts of speech. It is obviously a verb. But do you aggressively or passively act? Are you proactive or a procrastinator? It is a rare situation that procrastination would be a good thing, but I can think of just a few situations that it would help you. But being aggressive versus passive are actions that can help with your productivity. Aggressive versus passive action are important when it comes to teamwork. A huge part of personal, but more importantly professional success is our awareness of when to be aggressive versus passive. I will preference my words by saying this first; you will never be able to please everyone. And that shouldn’t be your goal anyway. However, you should be attempting to put you and your team in positions to win. Depending on the task, it is vital to figure out when you should aggressively take the lead or when you should passively lead. I know being passive can come across as being lazy. But I think this only the case when people are passive when they should be more aggressive with their action. But we have also seen the opposite of people who are too aggressive when they need to be more passive. The decision to be aggressive versus passive is a monumental decision and affects the success of all your projects. So choose well, but diversify your actions. What people are currently supporting you personally and professionally? How do you fit in with your team of coworkers? If you are a business owner, how did you go about selecting your team members? You have heard that “Teamwork makes the dream work.” You may not be a dreamer, but we all should have personal and professional goals. It is important for you to know that just one person rarely accomplishes goals. If you show me an accomplished person, I will show you a person that has been shaped, pushed, and/or supported by others. This is one reason why diversifying your team is vital to your success. The people on our teams help to shape our thoughts and how we choose action. Having a great support system means having diverse support system. You don’t want a team of people that all do the same thing. Finding people with different strengths, communication skills, connections, and leadership styles is crucial to any team or organizational success. If you are comfortable and you don’t need any further success, you may not need to diversify. But if you want to be at your best and reach your maximal potential, you need to consider diversifying your life. Success is waiting for you. If what ways do you need to diversify your life? Please leave a comment below, send me a tweet on Twitter, or leave a comment on Facebook.